696—Consecration of St. Willibrord as missionary to what would later become the Netherlands. 1145—The right to elect bishops granted to the Church of Utrecht by Pope Eugene III. 1215—Fourth Lateran Council confirms the right to elect bishops. 1520—Pope Leo X issues Debitum Pastoralis removing external control of the Church of Utrecht. 1692—Archbishop Petrus Codde accused of Jansenism by the Jesuits. 1701—Pope Clement XI suspends Archbishop Codde, which the canons and the majority of the clergy refuse to accept. 1703—Archbishop Codde resigns and the clergy refuse to accept a bishop appointed by the Pope. 1723—The clergy elected Cornelius van Steenoven as bishop and he is consecrated by Bishop Dominique Marie Varlet as Archbishop of Utrecht. 1725—Archbishop Steenoven dies and Archbishop Johannes Wuytiers is consecrated by Bishop Varlet. 1734—Archbishop Wutyiers dies and Archbishop Croon is consecrated by Bishop Varlet. 1739—Archbishop Croon dies and Archbishop Petrus Meindaerts is the last bishop consecrated by Bishop Varlet. 1853—Pope Pius IX reappoints Bishops for the Netherlands after being served by Vicars Apostolic since the year 1701. The Church begins to be called the “Old Catholic Church” to distinguish it from the Roman Catholic Church. 1870—The First Vatican Council declares Papal Infallibility. 1873—The German Old Catholic Church is founded under Bishop Reinkens. 1875—The Christian Catholic Church of Switzerland is formed under Archbishop Herzog in response to the First Vatican Council. 1877—The Old Catholic Church of Austria is founded. 1889—The Union of Utrecht is founded to bring together the Old Catholic Churches of Utrecht, Switzerland, Germany, and Austria. 1908—Arnold Harris Mathew, a former Roman Catholic priest, is consecrated Old Catholic Bishop of England. 1910—Archbishop Mathew separates from the Old Catholics for what he perceives to be a move towards Protestantism by the Church. He names his faction the “Old Roman Catholic Church” to distinguish it from the Old Catholics. This name was also previously used by Old Catholics prior to 1853. 1911—On August 5th, a conference took place in Bredon’s Norton, Worcestershire, attended by Metropolitan Gerassimos Messarra, Archbishop of Beirut, Legate of the Greek Orthodox Patriarchate of Antioch, Archbishop Mathew and others. After a long and full discussion, the faith of the Old Roman Catholic Church under Archbishop Mathew was considered in full accord with that of the Eastern Orthodox Church. Archbishop Mathew was then solemnly received by Mgr Messarra on behalf of Gregory IV (Haddad) and the Old Roman Catholic Church into union with the Greek Orthodox Patriarchate of Antioch as an autocephalous jurisdiction of the Holy Synod. 1912—February 26th, His Holiness, Photius, Pope and Greek Orthodox Patriarch of Alexandria also accepted and recognised the union. 1913—Archbishop Mathew consecrates Prince-Archbishop Rudolph de Landes-Berghes as Missionary Bishop of Scotland. 1914—Prince Archbishop de Landes-Berghes moves to the United States of America. 1916—April 14th, Canon Bernard Mary Williams was consecrated by Mgr Mathew. July 2nd, Mgr Mathew consecrated Canon James Columba McFall as Bishop for Ireland, which country he detached from his own charge and constituted it a separate Province. October 4th, Prince Archbishop de Landes-Berghes consecrates Frs. Carmel Henry Carfora & William F Brothers for the Church. 1918—Archbishop Carfora becomes head of the Church in North America after the entry of Prince-Archbishop de Landes-Berghes into the Augustinians at Villanova. 1919—20th December, His Grace Arnold Harris Mathew, Archbishop and Metropolitan of the Old Roman Catholic Church in Great Britain, “de jure” Earl of Llandaff, passed to his rest at South Mymms, Hertfordshire. 1920—November 17th His Grace Rudolph Francis Edward St. Patrick Alphonsus Ghislain de Gramont Hamilton de Lorraine-Brabant, Prince de Landas Berghes et de Rache, Duc de St. Winock, passed to his rest in the Augustinian monastery at Villanova. 1922—July 9th, James Bartholomew Banks is consecrated bishop by Frederick Samuel Willoughby. 1925—Msgr Williams issued a new constitution which repudiated the whole historical and doctrinal position of Old Roman Catholicism, the very position which Archbishop Mathew had stood firm. (The Pro-Uniate position stems from this Constitution.) May, the Old (Roman) Catholic Church of America (OCCA) is legally incorporated, Wisconsin IL. November 7th, Paul Francis Cope is consecrated bishop by James Bartholomew Banks. 1926—Archbishop Carfora establishes the Mexican Old Roman Catholic Church. 1933—August 15th, Francis Xavier Resch is consecrated bishop by Carmel Henry Carfora. 1940—January 7th, Edgar Ramon Verostek, is consecrated bishop by Albert Dunstan Bell, Archdiocese of California. December 8th, Francis Xavier Resch consecrated bishop by Carmel Henry Carfora. 1941—April 16th, Richard Arthur Marchenna, consecrated bishop in Chicago by Carmel Henry Carfora. 1942—July 30th, Hubert Rogers is consecrated Archbishop of New York by Archbishop Carfora. 1947—Archbishop Williams excommunicates Archbishop Carfora and the Carfora Succession. 1948—January 31st, Archbishop Williams excommunicates Frs St John Seally and Geoffrey Paget King for schism; King leads alternative ORCCGB(2). 1950—March 23rd, Gerard George Shelley is consecrated bishop by Richard Marchenna in New Jersey. December 22nd, Fr Wilfrid Barrington-Evans and supporters secede from +Williams to form the Independent Old Roman Catholic Church, later known as the Old Roman Catholic Church (English Rite), through a Deed of Declaration. 1951—Fr Geoffrey Paget King leads an alternative ORCCGB(2) under the auspices of Archbishop Carfora. 1952—January, Fr G P P King begins reconciliation with Archbishop Williams ORCCGB(1). June 9th, Archbishop Bernard Mary Williams dies without a successor; reconciled with Fr King, he appointed him to be Administrator of the See on the event of his death, and received the Last Rites from him; negotiations were also under way to heal the breach with Carfora. 1953—February 26th, Archbishop Carfora, recognises Geoffrey Paget-King as ORCCGB(1) Archbishop-elect (after +Shelley). Resch succeeds Cope as Archbishop OCCA. 1954—Bishop Shelley is elected +Williams successor by the three remaining priests, Paget-King among them ORCCGB(1). 1958—January 11th, Archbishop Carfora dies; Archbishop Hubert Augustus Rogers is elected as his successor, General Synod confirmed his election to the Primacy of the Church in May NAORCC(1), though the Church in America divides into various jurisdictions. Sigismund Vipartas succeeds to the see of Chicago; Cyrus Augustine Starkey also claims succession but gives way to Richard Arthur Marchenna NAORCC(2)- two jurisdictions use the title NAORCC. 1960—Whit Sunday, Geoffrey Peter Paget King is consecrated as coadjutor Bishop for England by Archbishop Shelley ORCCGB(1). King declares that Vipartas, Marchenna, and Schweikert are the only NAORCC(2) bishops recognised by ORCCGB(1). 1961—John E. Schweikert becomes Bishop of Chicago NAORCC(2). 1962—Candlemas, Bishop Robert Burns recognises and joins Barrington-Evans’ ORCCGB(3). February, King promulgates new ORCCGB(1) Constitution, Burns accedes, Shelley and Marchenna decline, King declares See of Caer-Glow sedevacante. Burns withdraws from ORCCGB(1). 1963—January 1st, King excommunicates Marchenna. August 25th, Walter Xavier Brown is consecrated bishop by Francis X. Resch (OCCA). June 21st Shelley exommunicates G P King. 1965—Easter Day, ORCCGB(1&3) jurisdictions unite (Barrington-Evans & G P King). April 7th, G P King excommunicates Shelley. 1969—June 29th, George Fredrick Linale is consecrated a Bishop by Archbishop Shelley in the continuing See of Caer-glow. September 21st, Archbishop Hubert Augustus Rogers, consecrates Edward Carlton Payne, Bishop of New England NAORCC(1), he resigns 45 days later joins NAORCC(2). 1971—Barrington-Evans, Primate ORCCGB (1&3) dies, G P King succeeds as Primate of ORCCGB(1). 1972—April 30th, Archbishop Hubert Rogers resigned from the Primacy of the NAORCC(1); May 20th, his son James Hubert Rogers is elected Primate. 1974—July 20th Edward Carlton Payne consecrates Boniface Grosvold, Bishop of Niagra Falls NAORCC(2). November 30th Francis Peter Facione, consecrated Bishop of Devon by Andrew Gordon Johnston-Cantrell (ORCCNA). 1975—May 20th John Joseph Humphreys, OSJ is consecrated in Florida by Archbishop Shelley continuing See of Caer-Glow. 1976—August 25th, Archbishop Hubert Augustus Rogers passes to eternal rest in the Dutch West Indies. 1978—May 30th Edward James Ford TOR of Amida, is consecrated bishop by James Edward Burns of Staten Island NAORCC(1). 1981—The Council of Independent Catholic Bishops (a.k.a. the Council of Old Roman Catholic Bishops) is formed between Archbishops Humphreys, Rogers, Facione, Pyman, and Johnston-Cantrell for the continent of North America. 1982—G P King resigns as Primate ORCCGB(1). Thatcher succeeds as Primate of ORCCGB(1). 1983—January 8th, James Charles Hedley Thatcher is consecrated bishop by G P Paget King; the Tridentine Institute of Our Lady of Walsingham secedes from the ORCCGB(1) under Vicar General, George Saintsbury under the episcopal oversight of Bishop Georg Schmitz in Germany, who had been consecrated by King in 1968. 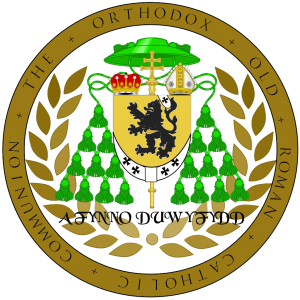 1987—June 22, Theodore J. Rematt is consecrated coadjutor bishop of Chicago by John E. Schweikert NAORCC(2). 1988—July 2nd, Dennis Matthew Peter St Pierre is consecrated coadjutor by Thatcher & King ORCCGB(1). Rematt succeeds Schweikert as Bishop of Chicago from 1988 through 2006 NAORCC(2). 1990—September 1st, Herve Lionel Quessy of Montreal is elected Primate of NAORCC(1), serving a mere eight months in the Primacy when he was required to step down for reasons of health and incapacity to fulfill the responsibilities of the office. 1991—January 24th, G P Paget King passes to eternal rest; Archbishop James Hubert Rogers also passes. September 1st, Archbishop Edward J Ford of Boston, Massachusetts elected to succeed Archbishop Quessy as Primate NAORCC(1). 1993—Following the retirement of Thatcher and the passing of Denis St Pierre, Douglas T Lewins succeeds as Primate of ORCCGB(1). 1997—November Ist, Archbishop Walter X Brown retires and on December 20th, Edward Bostwick is installed as Metropolitan of the OCCA. 1998—Lewins reconciles with Rome. ORCCGB(1) under administration by Mgr James Philips. 2002—March 10th, Archbishop Ford resigns from office of Primate NAORCC(1) for health and personal reasons; Archbishop Edmund F Leeman of Forked River, New Jersey succeeds as Primate of the NAORCC(1). 2003—Assumption Feast; Sherman Mosley is consecrated a bishop by James E Bostwick OCCA assisted by Louis Elias Milazzo and Gonzalo Jaromilla. 2006—Lewins returns from Rome and resumes Primacy of ORCCGB(1). Effects reconciliation between the See of Caer-Glow (Humphreys) and the ORCCGB(1). 2007—Archbishop Edward J Ford resumes primacy of the NAORCC(1). 2009—Archbishop Bostwick OCCA passes to his eternal rest. Mosley succeeds as coadjutor but is deposed by Synod and Henry Pleau becomes Archbishop. 2012—February 11th, Ronald Steptoe passes to his eternal reward, Louis Milazzo as coadjutor succeeds as Primate of ORCCGB(3). May 5th, Jerome Lloyd is consecrated Archbishop of Selsey by Boniface Grosvold (ORCCLR). The Walsingham Declaration is signed to increase cooperation between Old Roman Catholic jurisdictions globally, the initial signatories being Archbishops Jerome Lloyd OSJV (ORCCE) and Douglas Lewins (ORCCGB) and William Myers OSF (ORCCiA). 2013—October 15th, Charles Walders is consecrated by Henry Pleau in succession to Edward James Bostwick of the OCCA. 2014—May 29th Walders succeeds Pleau after his resignation OCCA.